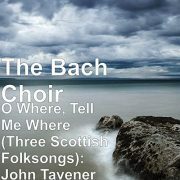 Commissioned by The Bach Choir, Sir John Tavener’s Three Scottish Folksongs were composed very close to the end of his life. For unaccompanied choir and tubular bells, the settings of The Bluebells of Scotland, My love is like a red, red rose, and the Skye Boat Song were premiered by The Bach Choir in the Oriental Art Center, Shanghai in April 2014. They are available to purchase as downloads only. Sign up now for regular news and concert updates from The Bach Choir.